Pedal exercisers are multipurpose, portable, affordable, workout machines that can add an exercise routine to the lives of people who believe that exercising is not something that they can do currently for a variety of different reasons. When pedaled with your feet, the best pedal exerciser can provide a workout for your lower body, but it can also be set on a table or desk to provide a workout for your upper body. Pedal exercisers are smaller and lighter weight than a stationary bike, so they can be taken with you and used in a larger variety of locations. Because pedal exercisers are just the pedaling mechanism, they are more affordable than a full stationary bike, other exercise equipment, and gym memberships. All of these benefits make them useful for people who believe that exercising is not possible for them. 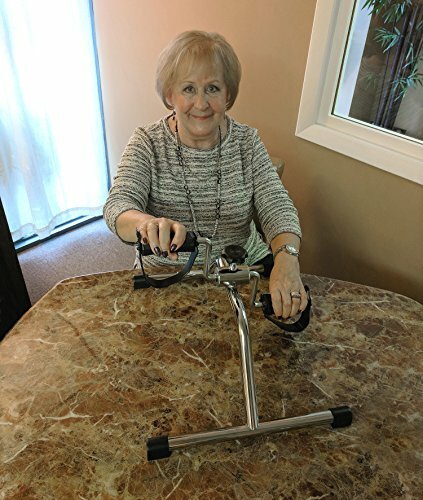 For seniors and those recovering from injuries, the best pedal exerciser provides a low-impact workout. Everyone else can increase the resistance to really burn calories, increase the cardio value, and increase the strength and endurance benefits. 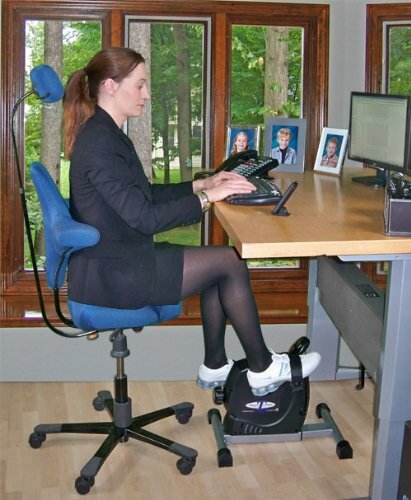 Those with sedentary jobs and those who lead busy lives can have a pedal exerciser under their desk to use while they are doing routine tasks. Others can use it while they are sitting at home reading, watching TV, or checking e-mails on the computer. Those who say they are too tired to exercise by the end of the day may be surprised to find that a little time spent pedaling is relaxing and rejuvenating. Check out our buyer’s guide for more details on these benefits and a discussion of features followed by the ten best pedal exerciser reviews. Adjustable resistance makes pedal exercisers more versatile for a variety of people, for a variety of situations, and allows for more customization in workouts. Those who physically need low impact exercise can keep the resistance low. When using it at work and multi-tasking, people can also keep the resistance low, but when they have a break, they can increase the resistance, increase their workout, and increase the benefits. Resistance can be controlled by a direct contact brake (friction) system or by a magnetic system. The friction system touches the disk, so it wears out pads that will need replacing. It is also noisier and generates heat. This system may be too noisy for an office or when watching TV, and the area near the disk may be too hot to touch after a workout. The magnetic system controls resistance without touching the disk, eliminating all of these issues. Pedal exercisers that have handles are lighter but stable and can even collapse, making it easier to move them around the house, take them to work, or take them on trips. The more portable a pedal exerciser is, the more often and more locations that you can use it. 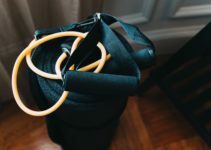 As already mentioned, pedal exercisers can be used with your feet and your hands, giving you both an upper and lower body workout in one small, portable piece of exercise equipment. The lower body workout benefits the hip flexors, the gluteus maximus muscles, the quadriceps, the calves, and the hamstrings. This can reduce back pain and improve posture. The upper body workout benefits the upper back, the biceps, the triceps, the shoulders, and forearms. This is a benefit not available with stationary bikes. Some pedal exercisers allow you to pedal both forward and backward. A higher heart-rate, higher energy-cost values, and reduced joint pressure have been attributed to being able to pedal backward on exercise bikes. Another benefit is increased blood flow that increases oxygen to the brain, increasing focus and energy. It is also a mood elevator. Finally, it burns calories, aiding in weight loss. Having a pedal exerciser with a display monitor will provide you with information on distance, calories burned, your speed, RPM, and time. This will give you numbers you can use to increase future workouts. Try the pedal exerciser before you buy it. Use it on both low and high resistance and with both your hands and your feet. 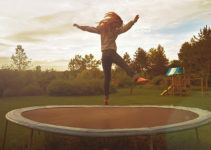 If it does not operate smoothly, it will be more tiring to use, and you will not use it. So, make sure that you buy a model that operates smoothly. You will also need to check the height of the pedals from the floor. Sit at the desk and raise your foot to that height. If your knee hits the desk, then see if your desk or chair can be adjusted to accommodate the exerciser. Make sure that you can use the exerciser comfortably if you lower your chair. 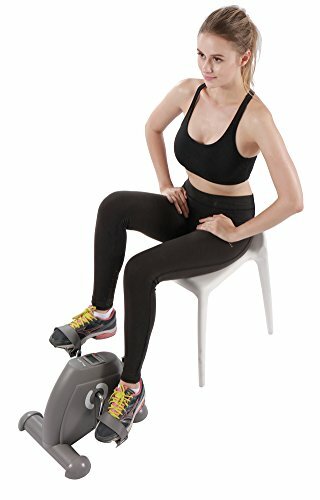 Now, check to see if the pedal exerciser will make you sit too far away from your desk to allow you to use your desk comfortably while you are using the exerciser. If so, you may have to choose another model. Besides being more convenient, pedal exercisers are more affordable than stationary bikes and gym memberships. A suggested leg workout is to set the pedal exerciser to a medium-high resistance, then pedal at a fast rate for a minute and a moderate rate for two minutes. Repeat these steps for a select period of time. Another routine is to set it at a medium resistance and pedal consistently for 30 minutes. For your arms, set the resistance at a level that gives you a challenging workout. Pedal for 15 minutes, then pedal backward for 15 minutes. If necessary reduce the resistance or build up to 30 minutes. Pedal exercisers need oiling occasionally. Taller people might not be able to use pedal exercisers under desks. The Vaunn Medical Pedal Exerciser is made with a one-piece, chrome-plated, steel frame for better stability. It is intended for physiotherapy on the arms or legs providing low-impact muscle toning and improved blood circulation. This exerciser provides adjustable resistance, rubber feet for better traction, and is fully assembled. Issues with it being noisy and hot to handle indicate a friction mechanism. It measures 16″ wide x 20″ deep x 14″ high and weighs 4.4 pounds, making it lightweight enough to be portable. However, some have found it to be jerky and prone to sliding. The Carex Health Brands Pedal Exerciser is intended for the arms or the legs. 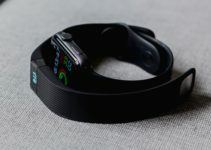 You can keep track of calories burned, your time, and your repetitions with the digital display. It has adjustable resistance, straps to keep your feet from slipping, and it folds. Since it was mentioned that it gets hot to the touch, it is likely to be a friction mechanism. It measures 14.5″ x 18.5 x 9.5″ and weighs 5.5 pounds. So it is lightweight enough to be portable, but some have an issue with it sliding. The Exefit Desk Exercycle Pedal Exerciser is portable, has adjustable resistance, and can be pedaled with the hands or feet. It is made with a heavy-duty steel frame and has rubber feet, so it won’t slide. 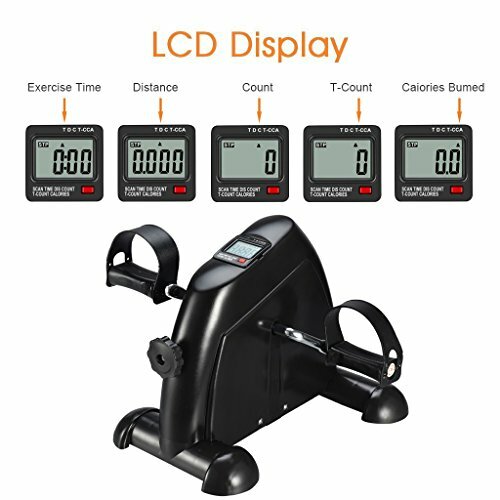 The LCD display shows distance in meters, repetitions, and calories burned. The battery for the monitor is included. It measures 13.75″ wide x 16″ long x 12.75″ high and weighs 6.6 pounds. 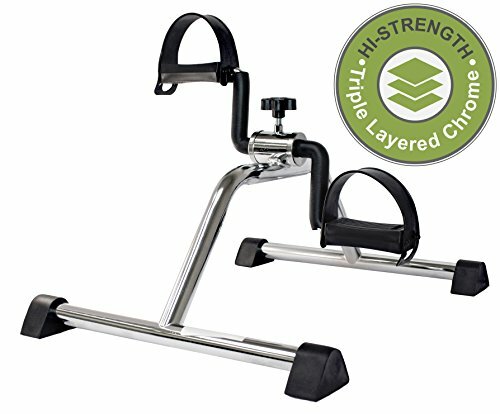 The Platinum Fitness Fit Sit Deluxe Pedal Exerciser can be pedaled with the hands and feet. The LCD monitor shows your exercise time, RPMs, revolution count, and calories burned. With its Cool Rev technology, it does not overheat. It is lightweight and folds, making it portable. The anchor strap prevents it from slipping, and the foot straps keep your feet on the pedals. It is available in blue, green, pink, yellow, and orange; measures 15 1/8″ wide X 17 3/4″ long X 10 1/8 high; and weighs 5.7 pounds. 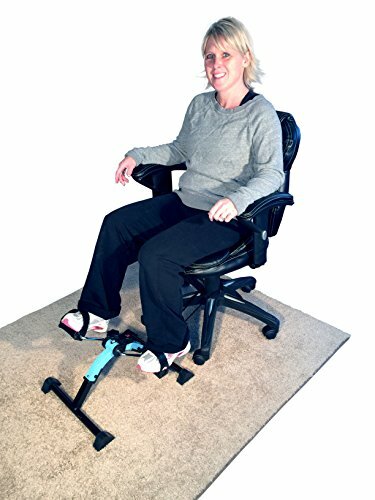 The Vaunn Medical Folding Pedal Exerciser tones and improves circulation in the legs and the arms. 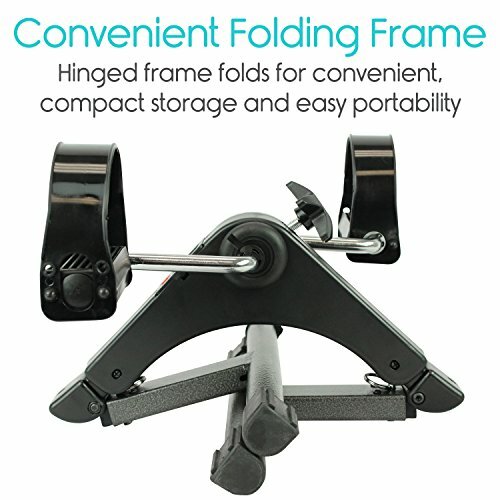 It folds easily and is lightweight, providing handy portability. This exerciser can be used for physiotherapy, providing improved muscle tone and improved circulation. The LCD monitor shows your exercise time, RPMs, revolution count, and calories burned. It has adjustable resistance, is built for stability, and weighs 6.8 pounds. The Bodyhealt Pedal Exerciser requires no assembly. It improves circulation and tones muscles in the arms and legs. This exerciser has a durable metal frame, adjustable resistance, and four rubber pads to prevent slipping. It is lightweight, sturdy, and can be folded for easy portability. The Bodyhealt Pedal Exerciser mesures 10″ x 10″ x 5″ and weighs five pounds. 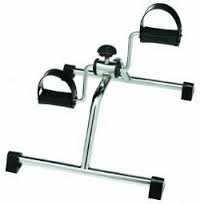 The TKWC Pedal Exerciser can be pedaled with your hands and with your feet and has adjustable resistance. The one-piece frame provides stability. The exerciser has anti-slip feet and pedal straps to keep your feet on the pedals. It measures 16″ wide x 13″ high x 19″ deep and weighs 4.5 pounds, so it is lightweight for easy portability. 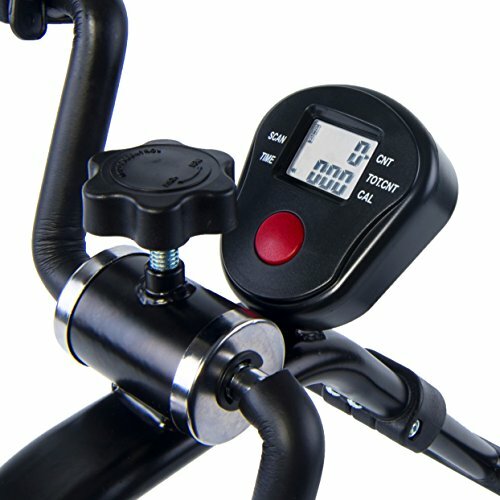 The MagneTrainer ER Mini Exercise Bike uses a magnetic resistance mechanism providing smooth quiet pedaling and offering twice the resistance of other pedal exercisers. It provides a maximum resistance of 400 Watts at 120 RPM and 170 Watts at 60RPM. It can be pedaled with your hands or your feet. The digital monitor displays your speed, distance, calories burned, and time. It has a wide base that provides stability. The pedals are large and have Velcro straps. It measures 20″ x 15″ x 18″ and weighs 23 pounds, so it is not as portable as other exercisers. 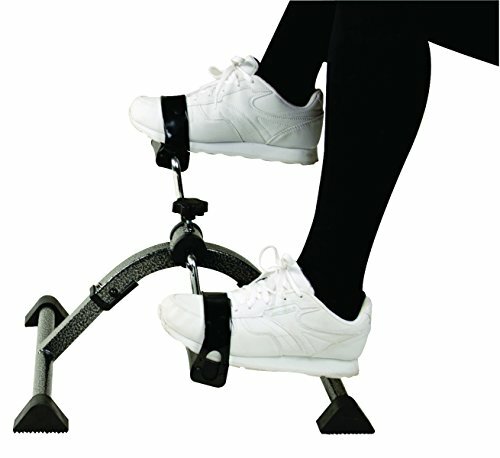 The Pleny Pedal Exerciser has a sturdy frame and non-slip feet. The adjustable resistance is easily changed with the dial controller. For physiotherapy, it tones muscles and improves circulation. The LCD monitor shows speed, time, distance, calories burned, and ODM. It measures 13.8″ x 15.7″ x 12.6″ and weighs 7.7 pounds, so it is lightweight and easily portable.